All RGS proteins possess the 120-amino acid RGS domain, but they can vary in length from 217 (GAIP and RGSZ1) to 1387 amino acids (RGS12). In addition to the RGS domain, RGS proteins have many different domains, suggesting selective regulation or multifunctional activity (Fig. 3). The multiplicity of RGS proteins suggests they might exhibit selectivity in the pathways on which they exert their actions. The following sections discuss different roles of RGS proteins. Fig. 4. 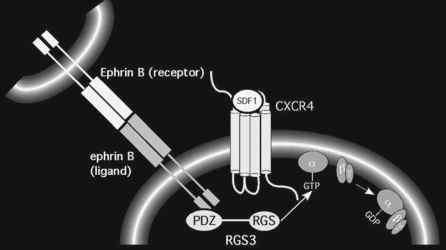 Inhibition of chemoattraction by ephrin B. PDZ-RGS3 is recruited by binding to the PDZ interacting domain of ephrin B and the RGS domain of RGS3 inhibits CXCR4 signaling by turning off the G protein. A subfamily of RGS proteins, C or R7 (14,15) (which include RGS6, -7, -9 and -11), binds to the G protein ß5-subunit. These RGS proteins contain a homologous domain, with Gy-subunits termed G protein y-like domains (37) Numerous studies have demonstrated the physiological importance of this subfamily of RGS proteins in the kinetics of light response (38-41). RGS7 has been shown to form a complex with Gß5 in retina (42). Gß5 knockout mice exhibit lower levels of RGS9 mRNA (43). The RGS9-Gß5 complex has been shown to stimulate the GTPase activity of transducin in its bound state to the effector, cyclic guanosine monophosphate (cGMP) phos-phodiesterase. A large percentage of RGS9-Gß5 complexes are tethered to the plasma membrane by an anchoring protein, R9AP (44). R9AP has only been detected in photoreceptors (44). The anchored complex shows a fourfold increase in GTPase activity (45). The N-terminus of RGS9, which contains a disheveled/EGL-10/pleckstrin domain, is believed to be important for this interaction (46). Mice lacking RGS9 or lacking an RGS9-R9AP interaction show a delay in the recovery from the light response (47). The physiological relevance of RGS9 in the visual system was underscored by a recent study in which it was demonstrated that patients exhibiting a condition known as bradyopsia had recessive mutations in the RGS9 or R9AP genes. These patients experienced difficulty in adapting to sudden changes in light levels and in seeing low-contrast moving objects (48). Members of the C or R7 subfamily are also expressed in other parts of the central nervous system. R7 proteins can increase tolerance at the level of p-opioid receptors. Knockdown of RGS9 and -11 by antisense oligonucle-otides increased the duration of morphine-induced analgesia (49). The RGS11-deficient mice showed reduced analgesic response to the 5-opioid receptor agonist [D-Ala (2)] deltorphin II, whereas the mice deficient in RGS6 and -9 showed alterations in the time-course of the effects of this agonist (50). Ga12 and Ga13 are known to activate growth-promoting responses and activation of c-fos through regulation of its serum response element (SRE). Activation of muscarinic receptors expressed in HeLa cells results in activation of PYK2 (a tyrosine kinase member of the Src-related family) and downstream activation of SRE-mediated transcription. These responses are blocked by a kinase-deficient form of PYK2. The GTPase-deficient form of Ga13 results in a potentiation of the response. This potentiation was blocked by co-expression of the RGS box of p115RhoGEF (54). Similar links to tyrosine kinase pathways have been demonstrated in studies of PDZ-RhoGEF and LARG. Activation of thrombin receptors result in the activation of the focal adhesion kinase, which in turn phosphorylates PDZ-RhoGEF and LARG (55). The tyrosine phosphorylation of these RGS proteins results in a sustained activation of Rho and creates a positive feedback loop for the activation of Rho by GPCRs (55). Modulation of calcium channels by GPCRs is a transient phenomenon; neurons become unresponsive upon prolonged exposure to neurotransmit-ters. Despite the common requirement of GRK activation for the onset of desensitization of transmitter-induced inhibition of calcium current in chick DRG neurons (56), Gr and Go-mediated inhibition desensitize at different rates (25). Activation of y-aminobutyric acid (GABA)b receptors in chick DRG neurons inhibits the Ca^.2 calcium channel in a voltage-independent manner through activation of a tyrosine kinase of the Src-related family (57). This inhibition desensitizes within 100 seconds (58). The voltage-independent inhibition requires activation of a tyrosine kinase that phosphorylates the a1-subunit of the channel and thereby recruits the binding of RGS12 (58). Introduction of a recombinant protein containing the sequence of the phosphotyrosine binding domain from RGS12 slows the desensitization rate of GABA-induced voltage-independent inhibition of Cav2.2 calcium channels, whereas the PDZ domain is not affected. RGS12 coprecipitates with the tyrosine-phosphorylated calcium channel. This RGS12-calcium channel association is decreased by pretreatment with genistein, a tyrosine kinase inhibitor (58). 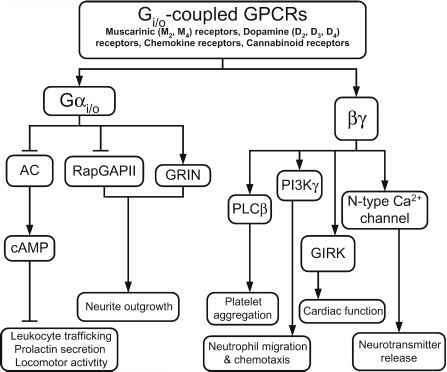 Another example of the role of RGS proteins in providing a link between GPCRs and receptor tyrosine kinases comes from studies of nerve growth factor (NGF) signaling in PC12 cells and the role of GAIP in bridging these signaling pathways (59). NGF binding to trkA receptors produces signals that are important for neuronal survival, axonal guidance, and differentiation (59). GIPC (a PDZ domain containing protein that binds to GAIP) can also bind to and form a complex with the trkA receptor. Immunofluores-cence experiments have shown that in retrograde transport vesicles, GIPC colocalizes with the tyrosine-phosphorylated form of the trkA receptor (59). Overexpression of GIPC in PC12 cells inhibits NGF-induced increases in phosphorylation of MAPKs. Interestingly, no change has been observed on the phosphorylation of other signaling molecules, such as phospholipase C-yl, Shc, or Akt. One of the first indications that RGS proteins could be more than just GAPs for heterotrimeric G proteins came from studies of the modulation of G protein inward-rectifying potassium channels (60). These channels are opened by direct binding of G protein Py-subunits (61). RGS proteins increase the speed of the deactivation of these channels, as is expected from a GAP; the a-GDP-subunit will bind to the Py-subunit, which is then no longer available to bind to the channel. In addition to the effects on the kinetics of termination of the response, RGS4 and -8 accelerated the rate of current activation (60). One potential explanation for these results is that accelerating the GTPase cycle can lead to a more sustained response by increasing the number of G proteins that can be activated. The role of endogenous RGS proteins in the modulation of voltage-dependent calcium channels was studied by Ikeda et al. (62), who used an approach that mutated a glycine to serine in the switch region so that the Ga-subunit became insensitive to the GAP activity of the RGS proteins. Additionally, they introduced a mutation that rendered the a-subunit of Gi/o proteins insensitive to pertussis toxin. In this case, both activation and deactivation kinetics of the ion channels were slowed. A similar approach used adenoviral delivery of RGS- and pertussis toxin-insensitive Ga-subunits to hippocampal neurons and yielded similar results (63). Experiments in which antibodies have been introduced into the cell bodies of neurons by microinjection have shown that RGS4 and GAIP have differential effects on the coupling of a2-adrenergic receptors to the inhibition of Cav2.2 calcium channels in chick DRG neurons (25). Removal of the N- and C-terminus domains of GAIP abolished this selectivity. RGS proteins might be regulated by calcium influx. Studies in which RGS3 was overexpressed in chick DRG neurons showed that deletion of the EF-hand of RGS3 abolished desensitization of transmitter-mediated inhibition of Cav2.2 calcium channels (64). The RGS3-mediated effects are blocked by a calmodulin antagonist.